Fully adjustable motorized hospital bed. Mattress provides maximum comfort for patient. Allows for air circulation to keep patient cool and comfortable. 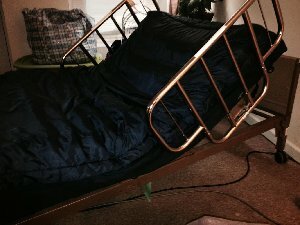 Bed w/ Mattress Category used other Free shipping unchecked Weight class HeavyBulky Item Price Hm, $600? + 10% + $25 = $700?